The Discover Virginia Food and Wine Festival is Greene County’s spring party and kick off of the Virginia Wine Festival season. The 6th annual festival will offer its unique atmosphere of family friendly festival entertainment, food vendors and wine tastings. For the first time, the Discover Virginia Wine festival will partner with Buy Fresh, Buy Local which helps consumers find local products while building relationships between growers, food artisans, farmers’ markets retailers, restaurants, and institutions. The festival will spotlight Virginia Wineries as well as many local restaurants and artisans. Whether you are there to taste wine, enjoy the bounty or fresh food, purchase unique local merchandise – the Virginia Food and Wine festival is a fun family environment – including the family dog! Aside from raising money for Greene Co. public schools, there will also be a donation to the nursing scholarship fund of Adriane Neumeister, widow of Dan Neumeister, former winemaker at Sugar Leaf Vineyards who was tragically killed last fall by a drunk driver, and had no life insurance. The event will feature wine and food matching seminars as well as bands and a variety of food vendors, as well as children-dedicated activities. Stevensville, Md. – March 28, 2011 – Blackwater Distilling™, Inc. today announced the launch of its flagship spirit, Sloop Betty vodka, a wheat- and sugar cane-based craft product. Part of an elite group of just 200 craft distilleries in the entire country, Blackwater Distilling is Maryland’s first federally and state-licensed beverage alcohol distillery in more than three decades. The initial distribution area for its spirits covers Maryland, Delaware and the District of Columbia. Sloop Betty, the fictional pinup character that graces every bottle, is a hot addition to the local distilled spirits scene. Crafted on Maryland’s Eastern Shore, Sloop Betty’s got the goods…in more ways than one. Though widespread distribution is set to launch April 1, Sloop Betty vodka has already been spotted on select restaurant and store shelves, such as Baltimore’s Woodberry Kitchen and Kooper’s Tavern. Initial supplies are limited; remember to ask for Sloop Betty by name at bars, restaurants and stores offering fine spirits. Though price will vary at individual retail outlets, Sloop Betty will be available for around $32. Superior taste is just one factor that distinguishes Sloop Betty. Maintaining the integrity of the land from which products are crafted is a cornerstone of Blackwater Distilling’s values. Dubbed the “Everglades of the North,” the Blackwater National Wildlife Refuge that is the distilling company’s namesake will receive a percentage of proceeds through the organization Friends of Blackwater National Wildlife Refuge. Vodka, the nation’s most popular spirit, makes up more than 24 percent of sales volume in Maryland and Washington, D.C., or approximately 1.2 million 9-liter cases. About 300,000 of those cases are super-premium, and sales of such quality spirits grew an impressive 90% from 2003 to 2009, according to data from the Distilled Spirits Council of the United States (DISCUS). Statistics from the Beverage Journal show that vodka overall grew by nearly 5 percent last year, and premium vodkas, like Sloop Betty, grew 12 percent. Based on Maryland’s Eastern Shore, Blackwater DistillingÔ, Inc. handcrafts super-premium spirits, such as its flagship product, Sloop Betty vodka. Made of the finest ingredients, Sloop Betty is best served over ice or in a glass neat. Any way she’s poured, we encourage adults to savor Sloop Betty and enjoy our products responsibly. Learn more about the company at www.SloopBetty.com and follow us on Facebook and Twitter (@sloopbetty). To celebrate this year's DrinkLocalWine.com conference - scheduled for St. Louis, Missouri April 2nd-3rd - ourselves, Virginia Wine TV, and My Vine Spot organized a couple sessions tasting Kansas and Missouri Norton wines along with Jennifer McCloud from Chrysalis Vineyards. The first session was a filming of a Virginia Wine TV episode released today showing McCloud and Ms. Ballard discussing the history of the grape as well as its migration west and then its return to Virginia via Dennis Horton. 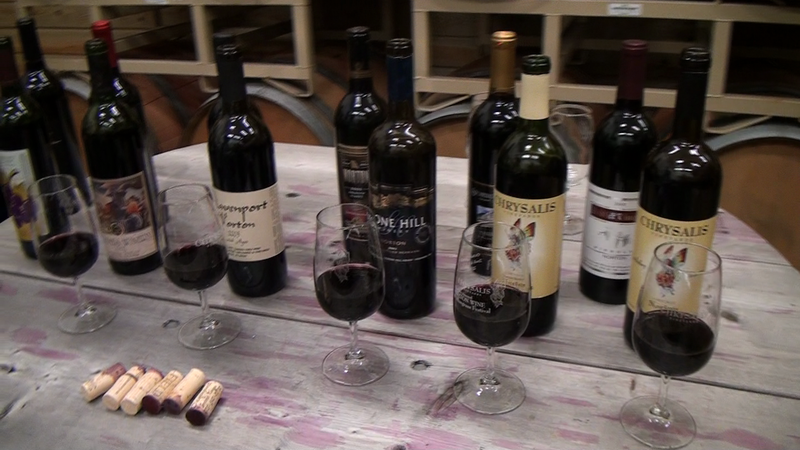 During the episode they sampled wines from several highly regarded wineries in the Midwest. You have to watch the video to see their thoughts. A week later Dezel and I organized a bloggers tasting of Norton wines at Chrysalis Vineyards with Jennifer McCloud leading the tasting once again. Along with several that I had accumulated while traveling to Kansas City, McCloud pulled a couple from her cellar as well as several older Chrysalis wines. The result of the tasting shows that, handled with care and aged, Norton wines are very drinkable and can exhibit the same complexity as wines made from viniferia grapes. We also found that the wines needed to be decanted before tasting as many had some reductive characteristics - but after several violent shakes of the glass - the aromas and flavors were properly released. Each of us had our favorites, and with McCloud's dedication to the grape there was no surprise that her wines were very good - whether the high end Locksley Reserve, the Estate Bottled Norton, or the fruity Sarah's Patio Red. The Westphalia Vineyards Norton was my favorite from the Midwest - this was a full bodied where the acids had been tamed and the wine mellowed to a smooth and very drinkable wine. And as expected the Stone Hill Winery Norton was quite nice. In neighboring Kansas, the grape is often referred to as Cynthiana and Holy-Field Vineyard & Winery releases a version that stands up to both time and being opened for over a week. The flavor profile from this wine most closely resembles those from Chrysalis - bigger than many of the Missouri wines but tame in its acidity. of his creations: Bouches with Thyme-scented Goat Cheese and Applewood Smoked Bacon and Garlic Crostini, Locksley Estate Venison Pate and Norton-laced Cranberry Chutney. He explained how to pair wine and food and the idea to balance the acidity in the wine with the flavor and acidity in the food. Obviously us mortals don't have the culinary skills to craft these items, but the idea is the same: wine is meant to be to enjoyed with food - Norton included. Take a peak at the DrinkLocalWine.com website and think about heading to St. Louis this weekend. You will earn why Norton is truly the "Great American" grape - the only indigenous grape variety that can be vinified into a full bodied comparable to the noble European grapes. Thanks to Jennifer McCloud for hosting these events; Hump Astorga; and all the participants; included Michael, Dezel of My Vine Spot, Chris Parker from New Horizon Wines, Raelinn from Wine Ophelia, and Alleigh from A Glass After Work. Here's the latest happenings going on at Kluge via c-ville.com. Mere weeks before the auction that will convey Patricia Kluge’s wine empire to the highest bidders, 20 former employees of the Kluge Estate Winery & Vineyard continue to maintain the foreclosed property’s vines and facilities. The workers, says winery employee Tim Rausse, are touching up everything from a 34,000-square-foot carriage house to an unglamorous “modular office” before the auction. The hum of a pressure washer is audible; Rausse explains that an employee is cleaning the winery production building. The Kluge Estate Winery & Vineyard, divided into six tracts totaling roughly 900 acres, will be sold at absolute auction on April 7—an event that may attract business tycoon and potential bidder Donald Trump, reportedly a friend of the Kluge family. When a winery doesn’t make bank, then the bank takes back the winery. However, after Farm Credit of the Virginias foreclosed on the Kluge operation, the subject of a $34.8 million lien, a December foreclosure auction failed to attract a sufficient bid. The bank bought the winery back for $19 million and plans to offer the business and property in six separate tracts, totaling more than 900 acres, at an April 7 absolute auction. The farm and winery equipment will be auctioned the following day. HR5034; which would have drastically threatened the direct shipping of wine, beer & spirits; died in the last session of Congress. But like the Phoenix it has risen anew in the current Congressional session as HR1161. The Terroirist blog has the links you need to stay informed and to help stop the Wholesalers from restricting consumer choice and the ability of small wineries, breweries, and distillers to sell their products out of state. 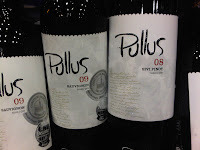 Here's our companion blog covering the Virginia Wine Expo. With the assistance of Dezel from My Vine Spot and Jenny McCloud, proprietor of Chrysalis Vineyards, we will be hosting a virtual tasting of various Midwestern Norton wines on Wednesday March 23rd in anticipation for DLW 2011: Missouri. Even though Chrysalis possesses the world's largest planting of Norton grapes in their Virginia estates, Norton is most popular in the Midwest and Plains states with the largest plantings in Kansas, Missouri, and Illinois. Norton is best served aged, so we will be opening 8-10 year old wines from Chrysalis as well as the wineries listed below. We encourage everyone to open a bottle of Midwestern wine on the 23rd, whether Norton\Cynthania or St. Vincent, Chardonel, Vignoles; or any other grape variety. Just use the #DLWMO hash tag to share your thoughts. Cheers. 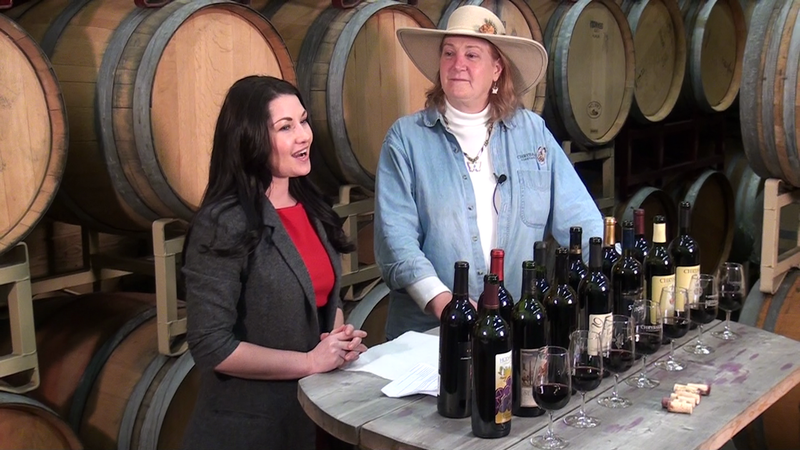 Check out this video promoting Virginia Wine TV and Virginia Wine Week. On a fairly regular basis they will be releasing videos covering many facets of the industry; interviews with winemakers, the Virginia First Lady, and critics; discussions about grape varieties; as well as short entertaining segments such as this video and soon, on dog friendly wineries. Plus each video will contain a musical theme performed by a Virginia born or based musician. In this case, Larry Keel & Natural Bridge provide the score. Check back often for new video releases. "We don't need no stinkin' vinifera: The grapes of Missouri" - now that's a seminar I'd like to witness. And you can too by attending the Third annual DrinkLocalWine.com Conference, held at the Doubletree Westport - St. Louis on April 2nd-3rd. Yes, there are a few vinifera wines crafted in the midwest, but local wine drinkers imbibe in plenty of Norton\Cynthania, St. Vincent, Chardonel, Vignoles, and several other labrusca and hybrids. 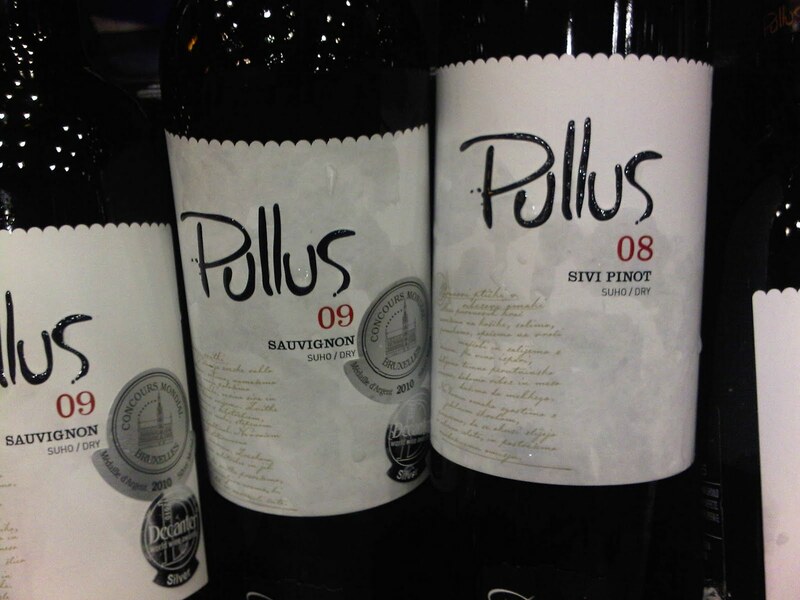 Having traveled to the area for the better part of a year, the wines are very good. Tickets to the conference start at a very reasonable $35 per session, with discounts for multiple sessions. Don't miss Doug Frost moderating the Grapes of Missouri session - he will make it entertaining; and plus there's the standard twitter taste-off and winery tours. Cheers. On Tap Magazine features our companion site at MyJoogTV with this piece in the March issue. The article, written by Jessica Strelitz, mentions the episodes featuring Tarara Winery and Black Ankle Vineyards.